December 17th may just be one of the top most exhilarating experiences of my life so far. 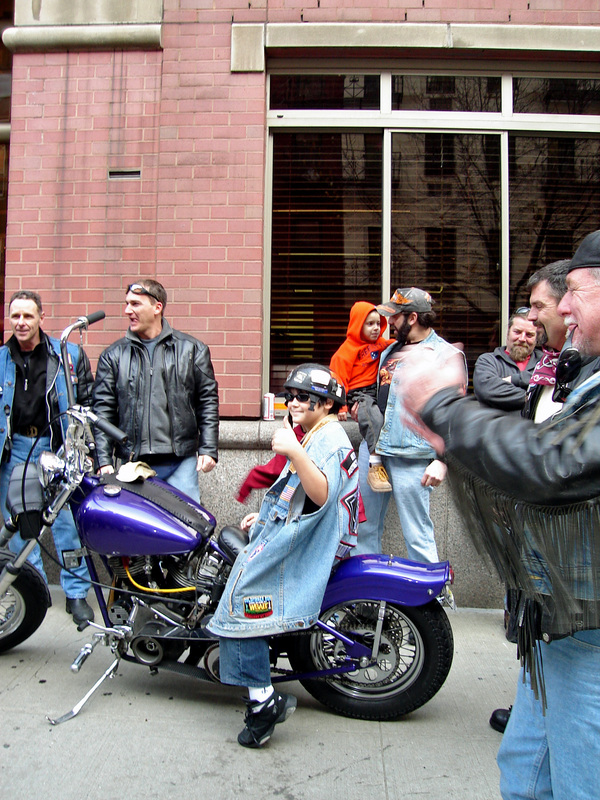 I was coming down York Avenue with Ivan when I saw a harley stopped square in the middle of the intersection at 73rd St. several blocks further down York was the rest of the gang – about one hundred of them. I love bikers. I love the incredibly loud rev of the engines when they’re out in force. Today they were out in force and it was loud. The leader was holding traffic at bay while the rest of the gang approached 73rd St. where they all turned left onto my block. I stood at the corner with goose bumps and a smile wondering where they were headed. It seemed to take 15 minutes to get them all through the intersection. They parked one by one lining the curb on my block. When they ran out of space on the street, they pulled right up onto the sidewalk. Following the pack were 3 trucks which turned onto the block as well. The pack leader then barricaded the street so that no other vehicles could enter. I ran home and got my camera. 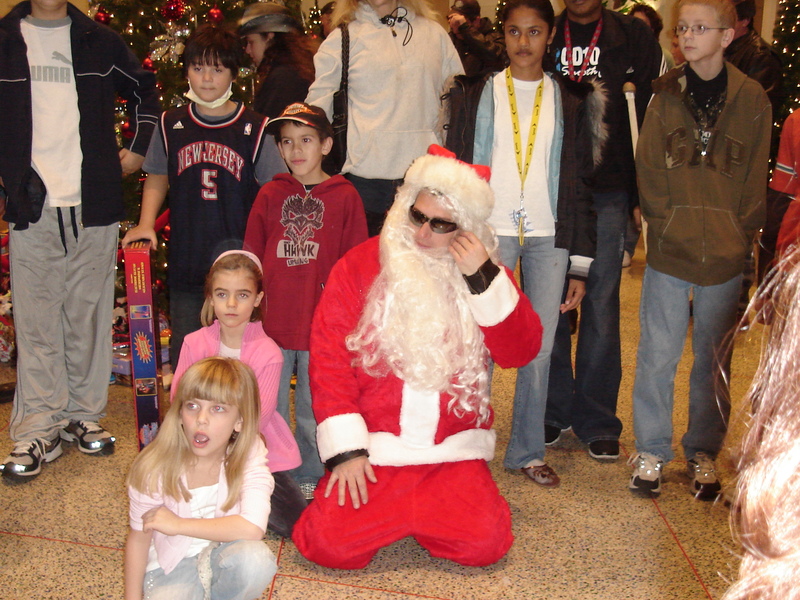 When I came back outside, 73rd street was being transformed into a winter wonderland full of joy & presents! The bikes were loaded with gifts for the children at the Ronald McDonald house. Teddy bears and games were protruding from backpacks as the bikers unpacked more goodies from their saddle bags. Some were sporting santa hats. 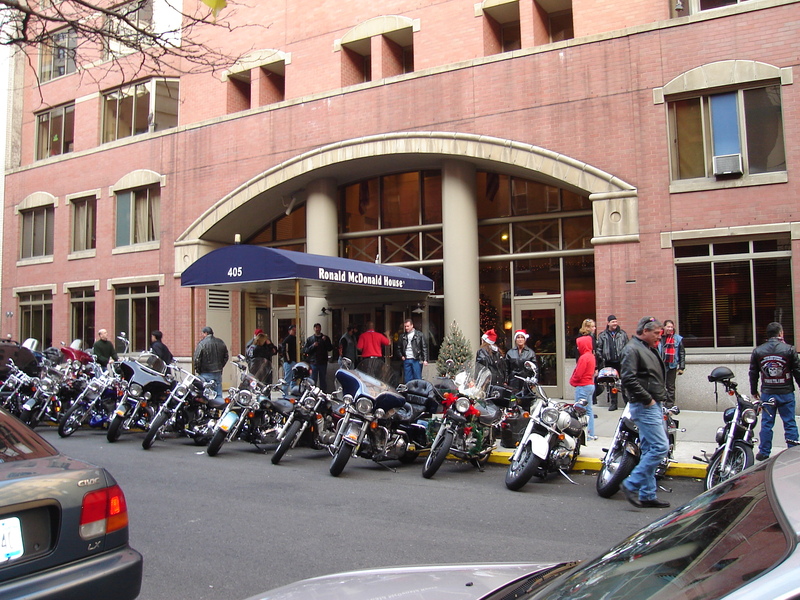 They descended upon the RMDH with their arms fully loaded with toys for the kids – a hundred bikers carrying dolls and teddy bears into the house. It was beautiful. At the end of the block the 3 trucks were parked. The doors opened. The trucks were loaded with more toys! 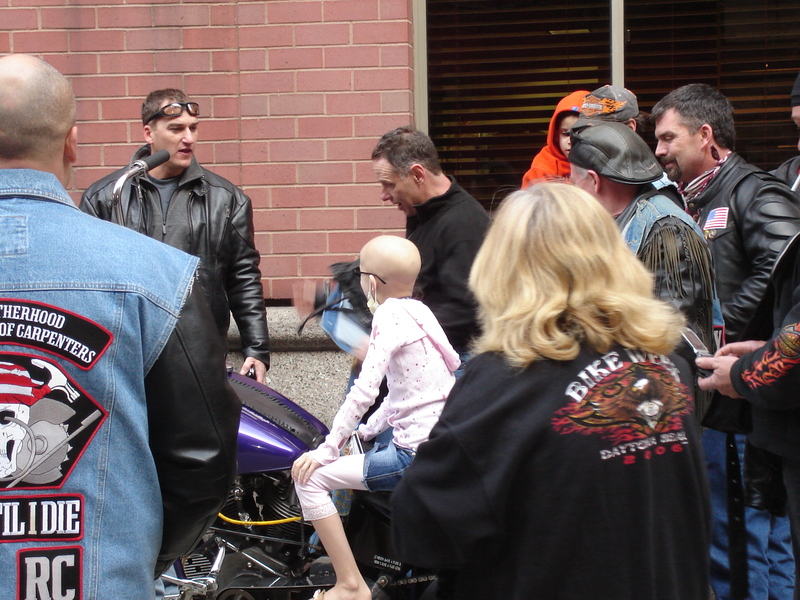 The bikers lined up to unload the games, puzzles, stuffed animals dolls and countless other items. It was a spectacular scene. In the lobby of the house stood a big christmas tree drenched with lights and ornaments, around which the bikers placed some of the gifts. I could see through the window the children gathering around the tree smiling and overjoyed. Over thirty minutes had passed since they arrived and the gifts were still pouring in. Presents were being stored in the living room as well, which I later found out were intended for children who were in the local hospitals. No disease existed in this moment. Everyone felt good. Everyone was happy. I asked one of the bikers if he would take my camera inside the RMDH and get a few pictures of the kids for me. He was dressed in leathers and a plaid flannel shirt, had sparkling eyes and wore a big red santa hat. He asked me my name. The children were as impressed with the bikes as they were with their new toys and soon began to wander outside to get a closer look. What happened next was thrilling. One of the bikers lifted a child onto one of the bikes parked on the sidewalk. Another took off his leather vest and put it on the child. Then another outfitted the child with aviators and gloves. Soon a line formed – all the children wanted to be a biker for just a little while. It turned into a game. Each time a child got on the bike, he or she would then pick which accessories they wanted from any one of the bikers. They would choose one man’s vest, another’s shades – whatever they wanted! 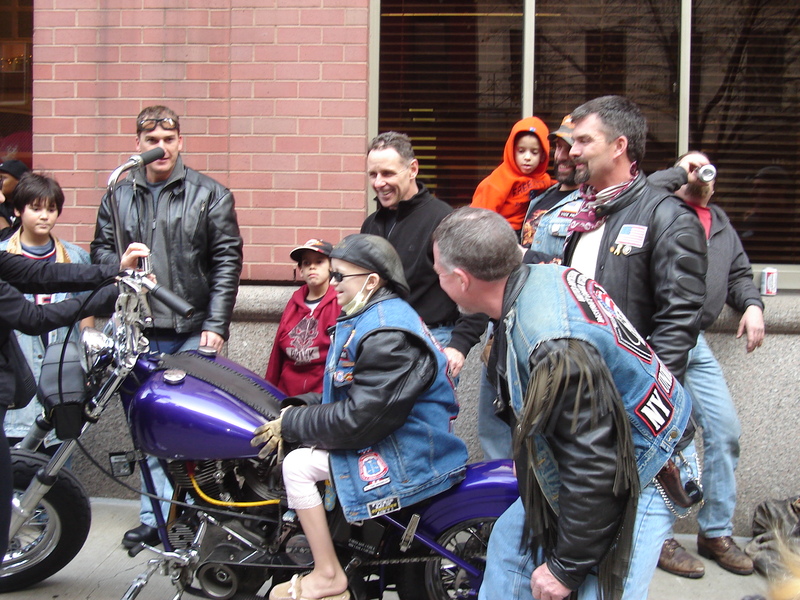 Instantly, sick children were transformed into harley boys and girls and the thrill was palpable. Their exit was as spectacular as their entrance. The bikes were lined up along my block on 73rd Street side by side from First Avenue to York Avenue. The men mounted their bikes and waited. Once the whole gang was ready to roll, the 1st biker reved up. Then the second, followed by the third – one at a time until the noise was overwhelming. As I stood across the street with tears rolling down my cheeks, I noticed my biker man with the sparkling eyes and the santa hat. He was watching me cry. Above the din he shouted “Merry Christmas, Laurie!” I acknowledged him with a smile. A hundred bikes revving, ready for take off, he got off his bike and crossed the street. He walked over to me and kissed my cheek. He then placed his santa hat on my head and returned to his bike. One by one they drove off. I will never forget what those men did for those children that day.